This project introduced a new service, where midwives at Macksville Health Campus deliver pregnancy and postnatal care to women in their home. It involves flexible rostering patterns to maximise existing staff and reduce staffing inefficiencies. To reduce the average length of stay (LoS) for postnatal inpatients by 27% and ensure 80% of women in the Nambucca Valley choose home maternity services after giving birth, by December 2017. Increases access to maternity services available in rural areas. Increases the flexibility of maternity services staff. Increases capacity for Antenatal Shared Care services with general practitioners (GPs) and tertiary referral hospitals. Improves the patient experience by reducing travel times and improving continuity of care. Enhances communication and collaboration between healthcare services. Improves community awareness of the range of birthing services available. Increases staff satisfaction and retention. Reduces transfers of women to tertiary referral hospitals during labour. The ‘Towards Normal Birth in NSW’ policy introduced by the NSW Ministry of Health in 2010 recommends that maternity services offer pregnancy and postnatal support to women in their home1. In MNCLHD, there is significant demand for this type of service, with the Pregnancy Care Service (antenatal clinic) at Macksville Health Campus struggling to keep up with demand from the local community. Despite the increasing popularity of the service, there had been no review since its inception in 2009. As of 2016, there were no home maternity services available in the Nambucca Valley. Prior to the project, the Pregnancy Care Service offered 20-minute appointments for one day a week, while the Maternity Unit was closed 40% of the time. This didn’t provide staff with the time or flexibility to deliver personalised care to women. However, there were enough midwives to staff the Pregnancy Care Service and Maternity Unit 100% of the time. This discrepancy was a result of using traditional staffing models that were based on the high birth rates experienced in the Maternity Unit in 1999. 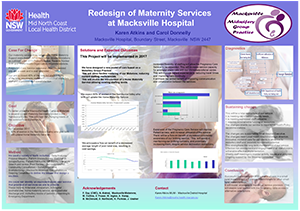 The inefficient use of midwifery staff led to staff dissatisfaction and high turnover rates, which impacted birthing rates, quality of care and workforce standards expected by Macksville Health Campus. The lack of home maternity services also meant there was no continuity of care for women in the area, which increased LoS as well as risk factors including transfers to a tertiary referral hospital during labour and unplanned caesareans. To maximise the use of midwifery staff and improve the care provided to women during and after their pregnancy, a new model of care was required. there was a lack of continuity of care for women. A root cause analysis was undertaken, using data analysis, process mapping, patient stories and surveys, staff focus groups and surveys, patient file audits, surveys with GPs, a literature review and peer review. an inflexible Pregnancy Care Service. It was determined that a group practice model of care was the ideal solution to address the root cause of the problem. This is a model where a small group of midwives provide antenatal, labour and postnatal care to women. They are employed under an agreement and staff the service based on patient and community need. Midwives who work under this model are on call during periods of low activity, when no inpatients are in the Maternity Unit. The framework and documents required to implement this model of care are currently with the executive team for endorsement, with implementation expected to start in July 2017.
use of Antenatal Shared Care services at Macksville and Coffs Harbour Health Campuses (target is an increase of 10%). The biggest challenge is engaging the project team so they embrace change and work together. Make sure that time and effort is invested in the diagnostic phase of the project, so you understand what the issue is before designing the solution. Successful implementation of this model of care in a small rural maternity unit will provide a benchmark for peer hospitals. Although the group practice model of care exists elsewhere, we were unable to find one with the unique aspects included in our model, which focuses on maximising service availability with existing staff resources. NSW Ministry of Health. Policy Directive: Maternity – Towards Normal Birth in NSW. Document Number PD2010_045. North Sydney: NSW Health; 2010. Homer C. Models of maternity care: evidence for midwifery continuity of care. Medical Journal of Australia 2016; 205(8): 370-374. The Nursing & Midwifery Office. Midwifery Continuity of Carer Model Toolkit. North Sydney: NSW Ministry of Health; 2012.